Luckily for Russell, her pit bull service dog, Samantha, has made a world of difference. Russell explains that Samantha can tell when she’s getting ready to go into an anxiety attack. Russell explains that it’s the pit bull’s friendly nature and loyalty that can make them awesome service dogs. 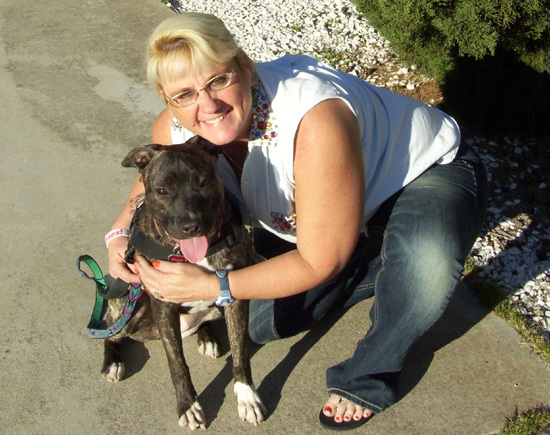 Samantha’s breed gives Russell the opportunity to educate the people she meets about pit bulls. Samantha is very sensitive to Russell’s moods and adjusts her behavior accordingly. “If I’m really depressed, she’ll come to me and lick my face. She won’t leave my side at all. She gets really mellow and calm when I start getting depressed. She lets me pet her and hold her – whatever I need to do. When I start getting to be my normal self again, she starts getting more active. It’s just amazing how in tune she is with me,” Russell says. Russell met Samantha when the pup was just 8 weeks old. It was shortly after Russell lost her last service dog, a Rottweiler/Rhodesian Ridgeback mix, to cancer. Now Samantha is 8 months old, and Russell knows the bond between them will to continue to grow. Awesome article! I love reading all your articles…I wish more people would give pit bulls a chance! Hopefully your articles will help with that. Thanks for your support. We have the best fans! More stories like this need to make their way around the world! Just think, Samantha is only 8 months old, and look what an angel she is! I’m thinking it’s this kind of story that will truly change the bad rap pit bulls have been getting for far too long! Keep them coming! Thanks so much for your support. We are hoping that StubbyDog.org will change the bad rap forever! I have to admit that before my son “tricked” me into allowing his Pit Lucky to come live with us I had a very bad attitude towards Pits. Now 5 years later I own one of Lucky’s daughters. Daphney will be a year old this month! And she is the funniest most lovable cuddly pup we have ever had. She is almost always on somebodies lap or begging to play. And when our grandson comes over they are inseparable.I can’t imagine not having a Pit as a part of our family. Unfortunately our town has an ordinance against owning Pits, so we have to disguise her heritage when registering her.IF they only knew! Thanks for sharing Holly. It’s so sad you can’t admit to having a pit bull in your town. Hopefully one day, all breed bans will be a thing of the past. Check out another article that you might find interesting: http://stubbydog.org/the-psychology-of-breed-bans. Thanks for your support of StubbyDog. friendly a pit bull can really be. I truly belive in educating the public about this wonderful breed of dog and the fact that she is also my saving grace by helping me with my medical conditions al well. Thank you Micaela. You are so welcome Diana. Both you and Samantha are an inspiration and go a long way to change the perception of pit bulls. We are all richer for sharing your story with others. I am Samantha’s auntie- and I am prejudice. I know for a fact that Samantha-Elvis and our beloved Cinnamon are true service dogs. One time in a Costco- Elvis and Cinnamon knew I was having a diabetic attic and told Diana and her husband. Cinnamon has passed but forever in our thoughts each and every day. Samantha has brought joy to Diana and knowing that she keeps Diana safe…. is a great thing . Thanks for sharing that story Stacie, truly amazing. The power dogs have to connect with us never ceases to amaze us all. What an awesome story! I have a pit service dog. He helps me with anxiety and depression as well as mobility support for virtigo and syncope attacks. So cool!!! @davesprettylady Thanks! If you want to share your story with us, we would love to hear it and share it with everyone. If you’re interested, please email [email protected]. that are scared of her because of her breed but the people that ask to pet her get a over amount of licks from her. Some people believe that a service dog shouldnt be pet while working but angel is out there spreading her love around! I know angel has changed some people minds on pitbulls. what can i say she is always there for me.